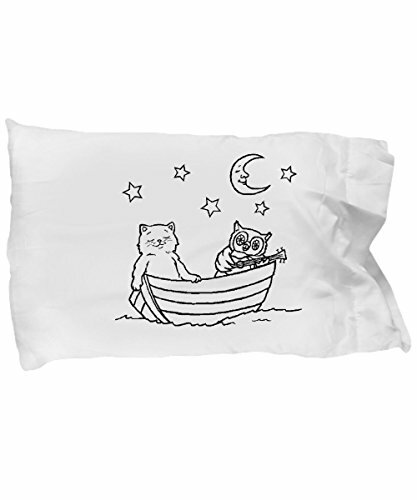 Colortime pillowcases with owl and pussycat. Kids' fun coloring time by MugsGaloreGifts at Animal Backgrounds. MPN: GB-1660418-42-White. Hurry! Limited time offer. Offer valid only while supplies last. Time for coloring pillowcases. What about your next kids' birthday party? Could be a great way to keep kids quiet or as a gift when they leave! Time for coloring pillowcases. What about your next kids' birthday party? Could be a great way to keep kids quiet or as a gift when they leave! This coloring craze for adults and kids is a great way (according to none less than Carl Jung!) to access your subconscious. It is also a great alternative way to relax and even as a form of meditation and mindfulness. Black and white designs ready to color. Makes a great gift for Birthdays, Anniversaries, Mother's Day, Father's Day - you name it! Get your kids away from their phones and let them play real kids' games and fun for a change. Standard Size Pillowcase. Coloring pillowcases with animals. If you have any questions about this product by MugsGaloreGifts, contact us by completing and submitting the form below. If you are looking for a specif part number, please include it with your message.